Warwick, RI: Gulpfish.com has entered the Social Media market in a new BIG way! ”We have created the first television application that allows companies and their potential job search candidates to connect and interact in a social environment on their Samsung application enabled internet televisions. We are re-defining what TV apps can do, as our application links user’s on-line accounts with their TV’s,” said Gulpfish, Inc. CEO and founder Ilya Reikhrud . The majority of applications that are available for the Samsung TV are strongly focused on entertainment. 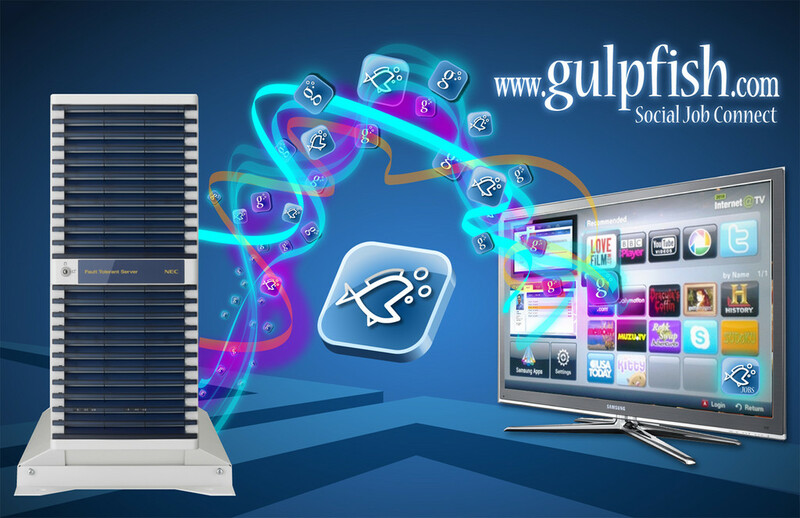 Due to the development of the Gulpfish Social Job Connect Application users are now able to use their TV sets for purposeful, productive and engaging activities that ultimately will allow the user to find and to be found by employers. This new concept of bringing your career search to your television allows not only yourself, but your entire family to be part of your career search. and it’s follow up, House party 2. Full Force’s Bowlegged Lou, Paul Anthony, and B-Fine will be engaging audiences throughout the entire CES as well as scheduled engagements at their Gulpfish booth # 26420 at 2PM Thu, Fri, Sat, and Sunday (January 6-9, 2011 Las Vegas CES). A demonstration of this technology will be available at the 2011 International CES Gulpfish Booth #26420. Gulpfish, Inc. is designed to allow the job seeker and the employer to easily navigate the complex world of on-line career search. We are a private non-shared database of job seekers and employers. The site is dedicated to delivering an organized, accurate and personal experience between employers and job seekers. All job seekers and employers are registered users of gulpfish.com. http://www.gulpfish.com does not post job seeker’s resumes on other web sites nor does it link external jobs from other job search search web sites. Gulpfish own the internet’s only Intuitively Dynamic Search Platform. Our Patent Pending Dynamic Search Platform enables users to perform all search and communication functions from one web page eliminating both frustration and countless clicks to achieve a desired result.